The building blocks of matter in our universe were formed in the first 10 microseconds of its existence, according to the currently accepted scientific picture. After the Big Bang about 13.7 billion years ago, matter consisted mainly of quarks and gluons, two types of elementary particles whose interactions are governed by quantum chromodynamics (QCD), the theory of strong interaction. In the early universe, these particles moved nearly freely in a quark-gluon plasma. Then, in a phase transition, they combined and formed hadrons, among them the building blocks of atomic nuclei, protons and neutrons. In the current issue of Nature, an international team of scientists has presented an analysis of a series of experiments at major particle accelerators that sheds light on the nature of this transition. The scientists determined with precision the transition temperature and obtained new insights into the mechanism of cooling and freeze-out of the quark-gluon plasma into the current constituents of matter such as protons, neutrons and atomic nuclei. The team of researchers consists of scientists from the GSI Helmholtzzentrum für Schwerionenforschung in Darmstadt, and from the universities of Heidelberg and Münster (Germany), and Wroclaw (Poland). A central result: The record-breaking high-energy experiments with the ALICE detector at the Large Hadron Collider (LHC) at the research center CERN produced matter in which particles and antiparticles coexisted in equal amounts, similar to the conditions in the early universe. 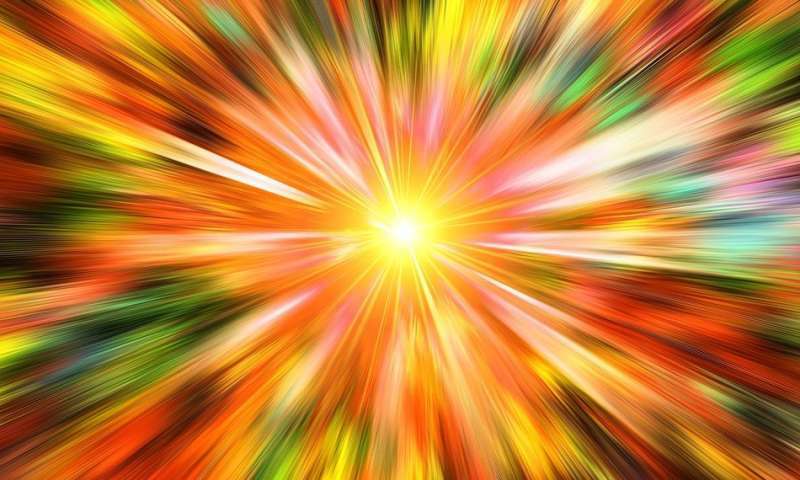 The team has confirmed via analysis of the experimental data theoretical predictions that the phase transition between quark-gluon plasma and hadronic matter takes place at the temperature of 156 MeV, 120,000 times higher than that in the interior of the sun. The physicists analyzed the yields of a number of particles and antiparticles. "Our investigations revealed a number of surprising discoveries. One of them is that light nuclei and their antiparticles are produced at the same temperature as protons and anti-protons, although their binding energies are about 100 times smaller than the energy corresponding to the transition temperature," explains Prof. Dr. Anton Andronic of the University of Münster. The scientists presume that such "loosely bound objects" are formed at high temperature first as compact multi-quark objects that only later develop into the observed light nuclei and anti-nuclei. The existence of such multi-quark states was proposed a long time ago, but no convincing evidence was found. Another remarkable observation concerns a phenomenon long known but poorly understood: Normally, quarks are confined into the interior of protons and neutrons; isolated quarks have never been observed, a property which scientists describe as "confinement." In the interior of the fireball formed during nuclear collisions at high energy, quarks are deconfined. The new study shows that charmonium states such as J/psi mesons, consisting of a pair of charm and anti-charm quarks, are produced far more often at LHC energies compared to observations at lower energies, such as at the Relativistic Heavy Ion Collider in the U.S.
Because of the higher energy density at LHC, a reduction of J/psi mesons through dissociation was expected. However, enhancement was predicted 18 years ago by two of the team members (Prof. Dr. Peter Braun-Munzinger, GSI, and Prof. Dr. Johanna Stachel, Universität Heidelberg) because of deconfinement of the charm quarks. The consequences of the prediction were worked out in detail in a series of publications by the whole team. The observations of enhanced production of J/psi particles confirms the prediction: J/psi mesons can only be produced in the observed large quantities if their constituents, the charm and anti-charm quarks, can travel freely in the fireball over distances of a trillionth of a centimeter—corresponding to about 10 times the size of a proton. "These observations are a first step toward understanding the phenomenon of confinement in more detail," says Prof. Dr. Krzysztof Redlich of the University of Wroclaw (Poland). In the ALICE experiment, scientists from 41 countries investigated the state of the universe within microseconds after the Big Bang by observing collisions between two lead nuclei. The highest-ever man-made energy densities are produced in such collisions. These result in the formation of matter (quarks and gluons) as it existed at that time in the early universe. In each head-on collision, more than 30,000 particles (hadrons) are produced that are then detected in the ALICE experiment. The actual study also used data from experiments at lower energy accelerators, the Super Proton Synchrotron at CERN and the Relativistic Heavy Ion Collider at the US-Brookhaven National Laboratory on Long Island, New York. "In the ALICE experiment, scientists from 41 countries investigated the state of the universe within microseconds after the Big Bang by observing collisions between two lead nuclei. The highest-ever man-made energy densities are produced in such collisions. These result in the formation of matter (quarks and gluons) as it existed at that time in the early universe. In each head-on collision, more than 30,000 particles (hadrons) are produced that are then detected in the ALICE experiment." Evidently, the 30,000 particles had already existed within the lead nuclei and had only become more evident due to the high temperatures of the collisions. Nothing was "created". Thirty pieces of silver was the price for which Judas Iscariot betrayed Jesus, according to an account in the Gospel of Matthew 26:15 in the New Testament before the Last Supper, Judas is said to have gone to the chief priests and agreed to hand over Jesus in exchange for 30 silver coins, and to have attempted to return the money afterwards, filled with remorse. The Gospel of Matthew claims that the subsequent purchase of the Potter's field was fulfilment, by Jesus, of a prophecy of Zechariah. Though the cat ring spread so thin in reality is still there, so is the quark-gluon plasma, was all ways so there! Wikipedia > In theoretical physics, quantum chromodynamics is the theory of the strong interaction between quarks and gluons, the fundamental particles that make up composite hadrons such as the proton, neutron and pion. QCD is a type of quantum field theory called a non-abelian gauge theory, with symmetry group. The QCD analogue of electric charge is a property called colour. Gluons are the force carrier of the theory, like photons are for the electromagnetic force in quantum electrodynamics. The theory is an important part of the Standard Model of particle physics. The QCD theory is explaining the laws governing the processes of quarks and their plasma in pristine proton production and nuclear interaction! The bigbang does not explain the production of the quark gluon plasma, as a bigbang idealises a singularity, implies a position vector, which by implication the quark gluon plasma was there before the bigbang! Observing collisions between two lead nuclei. Are they trying to convince that a collision between two lead nuclei in the early Universe was responsible for the creation of the very first particles of Matter? Of course not, as everything except hydrogen and helium (and a smidgen of lithium), lead nuclei were produced later. Lead is so heavy that stars cannot produce them, stops at iron/nickel, but are produced in supernovas. Cosmology 101; why not look it up in say Wikipedia and study some if you are interested? They use heavy nuclei because the collisions becomes more energy dense IIRC.